Shibata Katsuie, 1522?-1583 (here Chibata Shuri-no-shin Tatsuie) was a brother-in-law of Oda Nobunaga and one of his lieutenants. Tatsuie was a loyal subject who achieved much success, and from an early age joined the front line. A famous heroic story about Tatsuie tells that when he and his army were besieged in the castle of Chōkōji, in southern Ōmi province, their water supply began to run low. Here Tatsuie who had given his men his own water ration, smashed the last jar containing water in order to encourage his men to fight to the last rather than to perish from thirst. 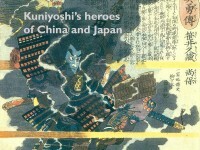 Later he became a daimyo (a feudal lord) until he was forced to commit seppuku in his castle of Kita no shō in Echizen. 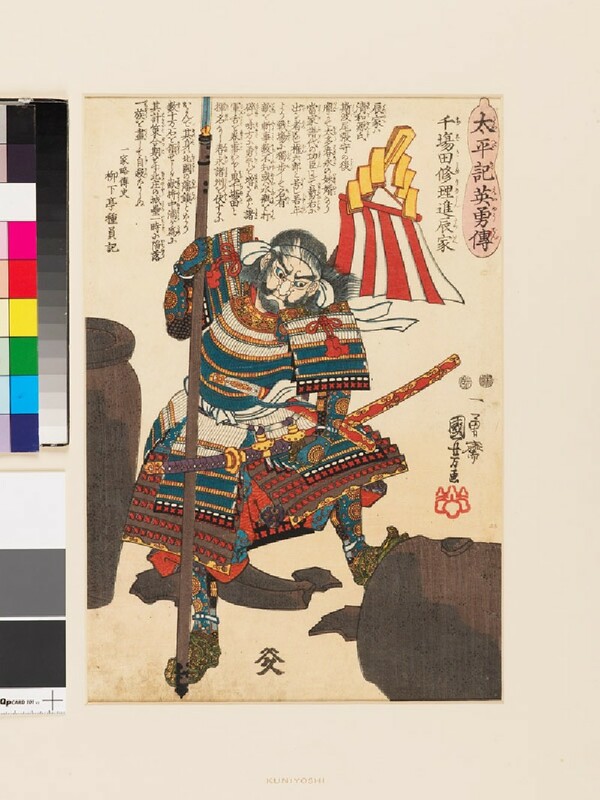 In this print, ‘Tatsuie’ or ‘Demon Chibata’ is depicted having broken a water-pot with his spear.